Apple announced that it is launching a trade-in program for counterfeit and third-party USB power adapters after a Chinese woman was allegedly killed by an electric shock answering a call on her iPhone 5. "Recent reports have suggested that some counterfeit and third party adapters may not be designed properly and could result in safety issues," wrote Apple in an official statement on its website today. "We are announcing a USB Power Adapter Takeback Program to enable customers to acquire properly designed adapters." 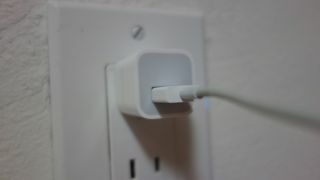 Apple noted that not every third-party adapter out there is designed improperly, but that it would include them all in the trade-in program that includes iPhone, iPad and iPod power adapters. You can put a price of this this potentially life-saving exchange apparently, as Apple is charging a fee for its trade-in program, as opposed to its pro bono replacement of iPhone 3G adapters five years ago. "For a limited time, you can purchase one Apple USB power adapter at a special price — $10 or approximate equivalent in local currency," said the company. That is about £6.50 in the U.K. and AU$11.20 in Australia. "To qualify, you must turn in at least one USB power adapter and bring your iPhone, iPad, or iPod to an Apple Retail Store or participating Apple Authorized Service Provider for serial number validation." The trade-in also requires you to travel to a physical store, but do not expect the workers there to tell you whether or not your charger is safe. "Due to the complexity of testing required to detect an unsafe or counterfeit adapter, Apple Retail and Apple Authorized Service Providers cannot advise you on the authenticity or safety of your adapter." The good news is that all chargers fall under this trade-in program, counterfeit or not. "Customer safety is a top priority at Apple," the company noted in its official statement. "That's why all of our products — including USB power adapters for iPhone, iPad, and iPod — undergo rigorous testing for safety and reliability and are designed to meet government safety standards around the world." The power adapter trade-in program kicks off in the US on August 16 and will come to the UK later this month.